[Furrtek] hooked up his Game Boy printer for use with a PC (translated). The two-part hack started with a cable to attach the device via USB. A Nokia interface cable was used as a base to translate the USB signals into serial, and an ATtiny45 microcontroller added to talk to the printer. He did a great job of free-forming the circuit alterations and fitting it back into the plastic USB plug housing.The next step was to write some software. Using VB6 he coded an application that loads in an image, scales it to fit, and allows you to adjust the contrast that the thermal printer produces. For testing purposes he’s reusing old receipts. See it in action after the break. 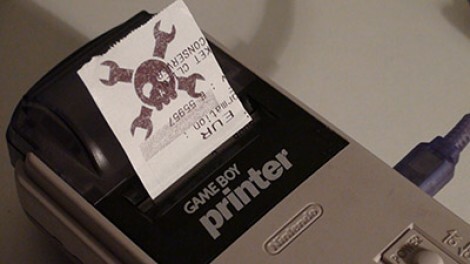 Holy crap, I remember having the gameboy printer with the gameboy camera! Nice work bringing an old gadget back to life! Yeah, me too. Back in 3rd grade I had the camera, and the printer. I remember Pokemon used to have an option to take pictures of the characters, and send them to the printer. Oh, the childhood memories. cool! I’ve wanted to do this with my gb printer since I got it a year ago just to get some use out of it. Now it’s time to make that Arduino cash register that uses this as a receipt printer! Awesome job to connect it to PC, btw. I could have sworn they printed faster than that. I used all the original paper printing out pictures from a game boy camera. The first link on his article is leading to his english version. I actually am inspired by this article to do just that. It really wouldn’t be difficult; one digital output to open the cash drawer, the serial pins to talk to the GB printer, and just use my Square account as a credit card processor. If I wanted to write the whole POS in Arduino, that’d be a lot more complicated, but why do that when you can get a pole display and barcode reader on eBay for cheap and just interface them to a computer? @Brian Recchia: HAD is really really really great for doing that with me too. Impressive, and you can still get the sticker rolls on eBay. I once used the Game Boy Camera, some plexiglass, and a light to create a home animation studio. If only I had a way to port my creations! I’ve worked in the field with Point of sale systems from IBM and remember thinking why the heck does a point of sale system need Windows 95 and a mouse? (Back in the late 90’s) . Keep it simple up front and let the back end systems do all the work I say. Even using a low power 8 bit cpu is enough horsepower for a register if u take out all the fancy stuff and keep it text based.